With the holidays fast approaching, it goes without saying there will be parties and gatherings that you will be hosting. Beverages will be served and accidents happen. If any of the popular beverages such as red wine, hot cocoa, eggnog, or apple cider should tarnish your carpet, we at Leading Carpet Cleaning have the solution for you. –	Immediately blot the excess moisture with paper towels or a dry cloth. –	Combine 1 tbsp ammonia and 2 cups of warm water and mix well. –	Using a clean cloth, sponge on the solution onto the blemished surface. –	Gently work out the cider in circular patterns in addition to blotting, working the stain from the outside in. –	Towel dry the remaining liquid. 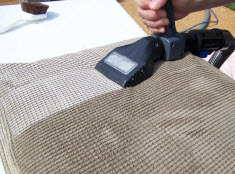 –	Allow to air dry and follow up with a vacuum once it is thoroughly dried. –	Use paper towels to remove excess or a clean cloth, if necessary, you may need to use a spoon to scoop up the bulk of the substance. –	Mix ¼ tsp liquid dish soap in 2 cups warm water. –	B sure to avoid using detergent or even a higher concentrated mixture. –	Rinse out the stain with warm water, be sure to blot up moisture in between, you do not want your carpet soaked. –	Sponge your mixture to the area and gently pat up the stain. –	If a residue persists, use a vinegar solution of 1 cup white vinegar and 2 cups warm water, and gently work the solution thoroughly. –	Using a clean and dry towel blot up all remaining moisture. –	Blot excess liquid with paper towels or a clean dry cloth. –	Mix together 1 tbsp dish soap liquid, with 2 cups warm water and mix well. –	Blot until all liquid is thoroughly sopped up. –	Allow to air dry. –	Blot the spill immediately with paper towels, and continue to blot until the liquid as stopped blotting up. –	Drop a few ounces of cool water directly over the blemished area, and blot again. –	In a container of your choice, mix together 1 tbsp liquid dish soap, 1 tbsp white vinegar, and 2 cups of warm water mix we. –	Soak clean cloth in the mixture and began dabbing the remaining stain. Dab a clean, dry cloth in between treatments to keep moisture contained. You do not want the carpet soaked. –	Rinse the area with cool water, and blot dry with a dry cloth. –	Once area is fully dry, vacuum. **NOTES** Never use hot water; it can set stains into your carpet. Whether you decide to use our homemade remedies or store bought products, always perform a patch test in a inconspicuous area to ensure it does not compromise the integrity of your carpet. Use plain white cloths or paper towels as dye or print can transfer to your carpet. If stains persist, contact Leading Carpet Cleaning today to extract the stains! A carpet stain is a real problem for most people. No one wants to have their home looking dirty and messy due to stains on the carpet. The carpet is a big part of the room and when there are stains it can make the room and home look messy. That is why most people will take time to clean the spills, spots and stains. This is best done by a carpet cleaning specialist that has the ability to care for the carpet and clean the stains. If you have ever decided to clean stains on your own you may have noticed that after the stain was cleaned it seems to come back. That is what is called reappearing stains. There are a few reasons that stain that you originally thought was gone can come back. Soiling Can Cause Reappearing Stains: When you go to clean a stain off your carpet you may just head to the store and pick up whatever cleaner you can find. The problem is that the cleaner is not always best for your carpet and you may not know the best way to use it. Soiling is when the spot that you have cleaned comes back up from dirt. The spot that you cleaned is usually left with residue from the cleaning material that you used. Even though you may have used a good cleaner you still need to use it correctly. If you leave a small amount on the carpet it is called residue. The residue is what will cause the stain to reappear. The same liquid is not what comes back up the residue on that spot will collect dirt easily and it will stick to that same spot. That will make it seem like the spot has come back to haunt you. Wicking Can Cause A Stain To Reappear: The other reason that a stain can reappear is from a process that is called wicking. When a liquid is spilled on a carpet it will not only stay on the surface of the carpet but will soak into the fibers, backing and the padding as well. Once the spill has had time to get that deep in the carpet it will become a problem when you try and clean it. The cleaning process that you are able to do at home is not going to be able to get deep enough to remove the stain. That is how wicking is able to occur. When the surface is cleaned, the under layer of the stain is still there. All that it takes to make the stain reappear is when moisture or wetness is introduced into the area. The stain will come back to the surface of the carpet. This can happen days and even weeks later so it is important to have the stain treated by a professional. 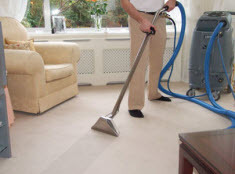 Leading Carpet Cleaning can meet all your floor and furniture cleaning needs. Contact us to schedule your next appointment today! Cleaning Spots, Stains & Spills From Carpets in Orange, Santa Ana, Rancho Cucamonga, Anaheim, Whittier, Riverside, Chino & Fullerton, California. Is Hiring Professional Tile & Grout Cleaners Worth it in Whittier, CA? Yes! DIY Tile Cleaning Doesn’t Cut it! Because tile is cool to the touch and easy to maintain, it is a popular choice in the Southern California area. Just like other types of flooring, maintaining and cleaning your tile and grout is important. Leading Carpet Cleaning is here to talk about the benefits of hiring professionals to clean your tile and grout. Your tile and grout is often an afterthought as you check tasks off of your cleaning list. Of course your tile flooring needs to be mopped and cleaned on a regular basis, but it also needs a deep clean just like everything else. Over time, your tile flooring takes quite a beating. Dirt and grime starts to eat away at the grout between your tiles. This will also cause discoloring and take away from the beauty of your tile flooring. On a tile floor, the grout lines are grooved and spills and dirt can accumulate in that area. When they sit on the grout for long periods of time they can cause damage that will be hard to repair. Having your tile and grout deep cleaned will help maintain the beauty of your tile flooring. Of course you can always get down on your hand and knees with a toothbrush and scrub your tile and grout. Depending on the space, this can end up taking you all day. Not only that, but it is physically hard to get the grout lines in your tile flooring as clean as they need to be. When a professional like Leading Carpet Cleaning cleans your tile and grout, we have the equipment needed to get your tile and grout cleaned in a small portion of the time it would take you to do it yourself. We have tools that are specifically designed to get your tile and grout back to their original color, and as beautiful as ever. How Long Does it Take to Have Your Tile & Grout Professionally Cleaned? There are variables that decipher how much time it takes to get your tile and grout professionally cleaned. On average, it takes about 30-90 minutes to have your tile and grout cleaned. This can change depending on the size of the room that is getting cleaned, as well as the condition in which your tile flooring is in. If you have heavy soiling on your flooring, it could take a bit more time to get them completely done. When you have your tile and grout professionally cleaned, you also want them to be sealed afterwards. This will protect your tile and grout from future spills and damage. This protective sealer will help you maintain your tile and grout, which will in the end, extend the life of your flooring. 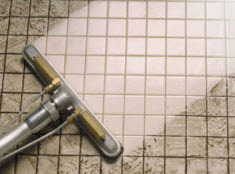 Leading Carpet Cleaning doesn’t only clean carpets, but tile and grout as well. We can clean and seal your tile and grout to keep your tile floors beautiful. Call us today! If you wanted to call a carpet cleaning company out to clean your carpets you might be interested in what the cost is going to be. Although you cannot come up with an exact amount there are many things that are considered when the price is quoted. Some companies offer specials that are set to entice you to get them out to start the cleaning. It is a great way for them to show you what a great job they can do with the hope that you will continue to be a repeat customer. With a company that is not offering a special or you are ready to use them on your repeat visit you can look at your carpet and know what factors they might consider. How Big is the Carpeted Area to Be Cleaned: One of the biggest things that is considered when you are getting an estimate is the size of the carpeted area. If you call in advance you can let them know the size of the house and the amount of rooms that you want to have cleaned. If you are unsure of the square footage they will come out and take a measurement to determine the cost for the job. The larger the area the more it will be unless they offer a discount for doing multiple rooms and areas. Be sure to have an idea on the rooms you want and if you are having a professional out to clean you might want to consider more rooms. You need to also let them know if you have areas such as stairs and hallways that you want to have cleaned as well. Carpet Cleaning with Pets: You may not think that a pet are a big difference when the carpets are cleaned but they do. Pets that have even an occasional accident will leave a pet urine stain and smell that can linger for some time. The pet stain needs to be treated properly by a professional that has the right cleaners and equipment. There is also pet fur and hair that can be on the carpets that will need to be removed when the carpets are being cleaned. How Badly Stained Are Your Carpets: You need to also consider that amount of staining there are on the carpets. The more stains that are on the carpets the harder it will be for a professional carpet cleaner to come out and remove them while cleaning the carpets. They will want to see what stains there are and how bad they are. They will most likely have to pretreat them so that they are removed and look good when the job is done. This also includes high traffic areas and filtration soil as well. In Orange, Santa Ana, Rancho Cucamonga, Anaheim, Whittier, Riverside, Chino & Fullerton California. With all these things to consider that is why it is recommended to have your carpets professionally cleaned on a regular basis. That way they are treated for stains and spots often and they are not able to get too dirty. If you want to have your carpets cleaned, give Leading Carpet Cleaning a call today!